-The two sub-44 second times in the preliminary heats provided a clue that the men’s 400m would have a fast final. That chilled slightly when the times from the semifinals came back down to earth. Behind Van Niekerk, the race was historically quick. Lashawn Merritt, whose days of running personal bests were thought to be behind him, ran 43.65 from lane eight, the fastest time of his life. Pre-race favorite Kirani James probably thought 43.78 was good enough for gold, but instead he settled for bronze. In 2013, James also was the pick for gold and he didn’t win. It’s hard to quibble with his performance on Wednesday though. If 43.78 only gets you bronze, well there’s not a whole lot you can do. -The women’s steeplechase was the most competitive race of the meet thus far. Five women were in contention for gold after the last water barrier and three still had a chance for victory in the final meters. Habiba Ghribi, Hyvin Jepkemoi and Gesa Krause were all sandwiched together before Jepkemoi ultimately slipped through and crossed the line first. .13 seconds later Ghribi finished just ahead of Krause. American Emma Coburn was one of the five in the mix over the final meters, but she lost contact with the group and finished fifth. This looked like one of those races where any one of the five could have won the race. The pace was honest, but not ambitious. Much like Evan Jager in the men’s race, Coburn lacked that closing kick to stay in medal contention. As good as she’s been, it’s easy to forget she is still young (also like Jager). I thought 2015 would be the year when the Americans cracked the steeplechase code at the World Championships. They came up a bit short, but there is every reason to think they can do it at the Olympics next year. -More from Kenya….. in the javelin, Julius Yego threw the spear 92.72m, third best in history (with the new implements), and won the competition by over three meters. Kenya sits atop the medal table with six golds and eleven medals overall. -The US picked up three medals on Wednesday. They haven’t truly beat the form chart in any event and they’ve also lost their hold on events where they’ve been traditionally strong. Shamier Little and Cassandra Tate provided a nice boost in the women’s 400m hurdles. As expected, Zuzana Hejnova won gold in a world leading time of 53.50. Behind her, Little rebounded nicely from a shaky first two rounds to make a run for silver in 53.94. I guess she didn’t peak in June. Tate followed her across the line to finish third. -Merritt and the 400m hurdles represented the good for the US. The bad came earlier in the day with disqualifications, falls and some early exits. Marquis Dendy and Will Claye both didn’t make it out of triple jump qualifying, leaving Christian Taylor and Omar Craddock as the remaining Americas. Ronnie Ash, one of four Americans entered in the event was disqualified for a false start in the prelims of the 110m hurdles. After he was shown a red card he refused to leave the track for several minutes. The commentators took this occasion to point out America’s, let’s say liberal, reinstatement policy in domestic races. Frequently, meets allow athletes to run under protest after they’ve been tossed. But it hasn’t just been in the United States. 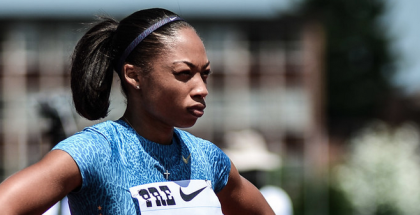 Earlier this season in Monaco, Dawn Harper Nelson argued her way back into her 100m hurdle race after she was disqualified. The circumstances surrounding her false start may have been different, but I can completely see why there is confusion amongst the athletes. Until there is one consistently enforced policy, it’s foolish to expect athletes to not try everything they can to get back into the biggest race of their season. All the other favorites moved on in the hurdles including David Oliver, Aleec Harris, Pascal Martinot-Lagarde, Orlando Ortega, Omar McLeod and Aries Merritt. 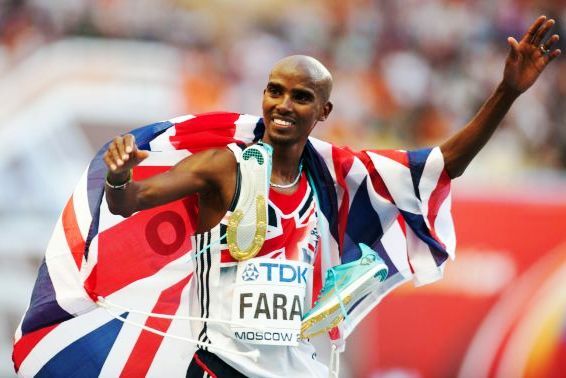 -Mo Farah almost took a header in the men’s 5000m prelims as the the large pack with 100 meters scrapped for positioning. None of them needed to win, or even place in the top five because they were all secured of a spot in the final since they ran so much quicker than the first heat. Apparently nobody knew that so they all tried to kill each other instead of cruising to the finish. Farah stayed on his feet and finished with the pack. Galen Rupp played it right, keeping out of trouble in the back and still comfortably qualified. The other two Americans, Ben True and Ryan Hill advanced. -Men’s 200m summary…..Weir out….Hughes in…….Gatlin devours stagger and runs 19.87 while shutting down early…..Bolt shuts down even earlier and goes 19.95…..see you Thursday…..